Town and Country Journal, 25 August 1900, p. 37. With the massive growth in literacy throughout the British Empire coupled with the global telegraph network, the Boer War became the first war where there was a saturation of Press coverage. The journalists were scorned by the senior officers but also found extremely necessary by their detractors to maintain the morale at "home". It was a tension that existed throughout the war between the journalist and the soldier. Regardless of what the soldiers thought of the journalists, the men and women who went to South Africa were extremely brave. They bore the same hardships as the soldiers in the field but were exposed to greater risks. Whereas a unit, and thus a soldier, may see action rarely, the journalists, by their very vocation, must seek the action all the time to report on it, thereby putting themselves always at risk of either injury, capture or disease. The casualty rate for journalists was high, exceeding 50% of all those who went specifically to cover the war. In a moment of reflection upon this high casualty rate, the Town and Country Journal published a list. This was no academic exercise in press naval gazing but a very real commentary on the loss felt by this newspaper, a loss shared by many others. At the top of the list was their own correspondent, Mr. H. H. Spooner, who died at Deelfontein from enteric fever. No one newspaper at the time was immune from these casualties. While soldiers were praised, the press carried on with their job of bringing the news, dying, invalided but failing to obtain similar national recognition. This is a tribute to those unsung heroes of the press corps. The Press at the War. Mr. H. H. Spooner, Sydney "Town and Country Journal," died at Deelfontein from enteric fever. Mr. William J. Lambie, Sydney "Daily Telegraph," killed at Rensburg. Mr. D. Macdonald, "Melbourne Argus," enteric fever. Mr. M. H. Donohoe, London "Daily Chronicle" (formerly of Sydney "Evening News"), captured. Mr. A. G. Hales. ("Smiler"), "Daily News," captured. Major Reay, "Melbourne Herald," enteric fever. Mr. G. W. Stevens, London "Daily Mail," died of enteric fever during the siege of Ladysmith. Mr. Alfred Ferrand, "Morning Post," killed at Ladysmith. Mr. Albert Collett, "Daily Mail," killed in action, Molteno. Colonel Hozier, "Sphere," killed near Stormberg. Mr. Ernest G. Parslow, "Daily Chronicle," shot dead by Lieutenant Murchison at Mafeking. Murderer, penal servitude for life. Mr. Mitchell, "Standard," captured, escaped, took enteric fever, and died. Mr. Charles E. Hands, "Daly Mail," dangerously wounded, Maritsani. Mr. Julian Ralph, "Daily Mail," struck by shell fragment at Belmont, and severely injured in accident. Mr. F. W. Walker, "Daily Mail," wounded at Stormberg. Captain Wright, "Daily Mail," wounded at dispatch riding. Lord De la Warr, "Globe," wounded at Vryheid. Mr. P. F. Reid (son of Sir H.G. Reid), "Echo," seriously wounded at Kheis. Mr. E. F. Knight, "Morning Post," shot with sporting Mauser bullet at Belmont; right arm amputated. Mr. Winston Spencer Churchill, "Morning Post," captured at Chieveley, afterwards escaped. Lord Cecil Manners, "Morning Post," captured near Johannesburg, and liberated. Mr. George Lynch, "Morning Herald" and "Echo," captured, released; in hospital with enteric fever; now in England. Mr. A. Graham, "Central News,” missing since May 21; supposed captured. Mr. A. F. Hellawell, "Daily Mail," captured. Rev. Adrain Hofmeyr, "Daily Mail," captured. Lady Sarah Wilson, "Daily Mail," captured. Lord Rosslyn, "Daily Mail" and "Sphere," captured. Mr. James Milne, Reuter's, captured. Mr. John Stuart, "Morning Post," nearly blind after siege of Ladysmith; recovered; now ill with dysentery. Mr. W. Maxwell, "Standard," enteric fever during siege of Ladysmith; recovered. Mr. H. S. Lyons, "Daily Mail," invalided, enteric, Durban. Mr. T. J. Greenwood, "Cape Argus" enteric fever, siege of Ladysmith. Mr. L. Oppenheim, "Daily Mail," invalided, enteric. Mr. Lester Ralph, "Daily Mail," invalided, enteric. Mr. R.C.E. Nissen, "Daily Mail," invalided, enteric. Mr. W. Martindale, "Central News," enteric, recovered. Mr. Alfred Kinnear, "Central News," enteric, recovered. Mr. Jos. S. Dunn, "Central News," twice captured, enteric, recovered. Mr. Charles Bray, "Central News," enteric, recovered. Mr. F. A. Stewart, "Illustrated London News," dysentery, at Durban. Mr. W. T. Maud, "Daily Graphic," enteric fever after Ladysmith, and invalided home. Mr. Buller, "Daily Telegraph," invalided home. Mr: H. W. Nevison, "Daily Chronicle," in hospital with fever, recovered. Mr. J. A. Cameron, "Daily Chronicle," enteric; permanently invalided. Mr. Brayley Hodgetts, "Daily Express," invalided with enteric. In this optimistic assessment of the impending Boer War, The Queenslander outlines its speculation on the probable course of the war. The article outlines the strategy to be employed. With inverse prescience, the role of Mafeking is illustrated as a key centre from which to launch an overwhelming attack. The Queenslander, 30 September 1899, p. 672. 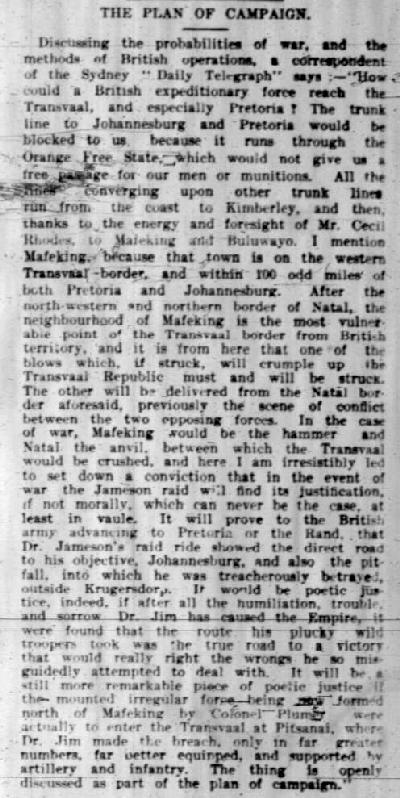 Interesting also is the use of the diminutive Dr Jim to describe the man Dr Jameson who led the infamous raid into Transvaal four years before. No, instead of being disowned by all and sundry, he was now being hailed as a hero. The fascinating feature is the smug self confidence of the author. At no stage does he even consider that the Boers might not be as compliant and be readily defeated in the manner described. With the benefit of hindsight, the assessment in this article appears risible but seen from banks of the Morton River in the warm comfort of Brisbane protected by the might of the British Navy, it seems like a natural conclusion. One wonders what the author thought of his belief in a quick victory some six months hence.